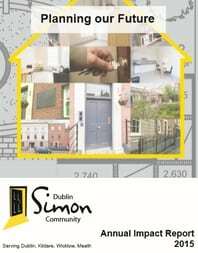 The Lord Mayor of Dublin, Brendan Carr, today (20 September) launched the Dublin Simon Community Annual Report 2015 at the Mansion House. Speaking at the event, Sam McGuinness of the Dublin Simon Community confirmed the charity’s commitment to the Government’s Housing and Homeless Action Plan, Rebuilding Ireland, however stressed the need for detail on specifics in the Plan which address long term homelessness. 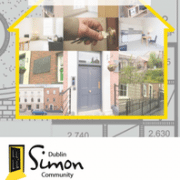 Click here to download the full 2015 Dublin Simon Community Annual Impact Report. 46% increase in housing capacity, through opening and acquiring 109 new properties in 2015. Ahead of Minister Coveney’s announcement on Pillar One of the Action Plan this Thursday, Mr. McGuinness said the thousands of vulnerable people who are currently rough sleeping and stuck in emergency accommodation needed hope. “With emergency beds across the city operating at full capacity each night, rapid housing and support for individuals is urgently needed to get people off the streets to safety and to tackle the bottleneck in emergency accommodation. “People have become trapped in the revolving door of homelessness and the short term measure of emergency accommodation has become long term. If we look at our emergency services for 2015, there was only a one in ten chance of moving out of emergency accommodation into a home, with 90% of our residents deemed long term homeless (longer than six months) and a shocking 59% homeless for more than two years. Mr. McGuinness continued by highlighting the increase in rough sleeping across the city, which was recorded by the charity’s Rough Sleeper Team, who provide housing assistance, harm reduction and medical services. 2015 saw a 32% rise in rough sleeping over the past year despite the provision of 195 extra emergency beds. Mr. McGuinness went on to say that the effects of the revolving door of homelessness was also extremely visible in the numbers accessing their treatment services. “70% of people entering into our Detox programme were homeless for more than six months and 50% were homeless for over two years. Last year we witnessed a 31% rise in the number of people accessing our treatment, recovery and counselling services and a 71% increase in demand for counselling, where we provided 1,712 hours of mental health support to people in crisis. Mr. McGuinness said that Simon is vigorously working with the resources at their disposable, to do everything possible to respond to the ever growing demand for housing and services. “As the numbers of people coming to our door for help continues to dramatically increase, we have utilised our limited resources to provide more accommodation and treatment services. Mr. McGuinness went on to say that bricks and mortar alone will not tackle the crisis. “To deal with shortage in treatment services, we are planning to expand and redevelop our treatment facilities. In the immediate term, we are increasing our capacity by 30% in partnership with MQI. Looking to the future, we will expand our facility in Ushers Island to provide additional post treatment beds so that Alcohol and Benzo Detoxification, Rapid Access Stabilisations, Respite Stabilisation Crisis Mental Health and Recovery services are on site. In addition to emergency and treatment response, and increasing their housing capacity, Mr. McGuinness said that keeping people in their homes and working with households at risk was a priority in 2015. Speaking about the recent Government commitments to tackle the homeless crisis, Mr. McGuinness emphasised the urgency at which Rebuilding Ireland must be implemented. Dublin Simon Community provided services to 3,500 men, women and children across Dublin, Wicklow, Kildare and Meath throughout 2015. In excess of 150 individual clients each month were provided with housing assistance, harm reduction and medical services by our Rough Sleeper Team. 845 GP consultations took place at our Mobile Health Unit, operated in partnership with Safetynet, providing free primary care to people experiencing homelessnes. An average of 470 harm reduction emergency needle exchange packs were issued each month. Average of 150 individuals, for September thus far, was counted sleeping in the inner city on our Early Morning Street Counts. 689 people were accommodated in our emergency housing with care plans focusing on physical and mental health, life skills, education and employability. 71% of new clients in our Emergency Accommodation were aged 31-49. 821 referrals were made to private rented, or local authority accommodation, treatment or medical services. 171 people who lived in our permanent supported housing received assistance with life skills, health and welfare, education and training. Over 230,000 meals were provided to clients across our residential services, with our kitchens providing nourishing food to improve their health and wellbeing. We had permanently housed 198 adults and 27 children, across Supported and Independent accommodation by the end of the year. By the end of 2015 we had increased our housing stock to provide 346 beds. We reduced the risk of 570 people losing their homes through our homelessness prevention and resettlement services in Dublin. 315 people across Kildare, Wicklow and Meath received housing advice, settlement, prevention and outreach services so that they could secure a home. 699 people accessed our treatment, recovery and counselling services, 31% increase since 2014. Our Aftercare service saw a 50% increase in the numbers accessing. Our Counselling service saw a 71% increase in the numbers accessing. 1,712 hours of 1:1 counselling support was provided by the Sure Steps Counselling Service. 254 people expanded and developed their skills, education and employability through our Participation and Development services. Over 500 literacy classes took place during the year.